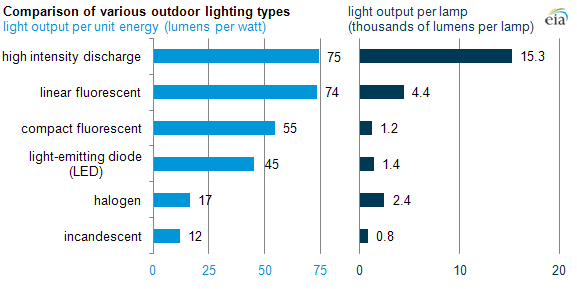 Source: U.S. Department of Energy Lighting Market Characterization. Most sports stadiums and indoor arenas use high intensity discharge (HID) lamps for almost all of their overhead lighting needs. On average, stadium lights have much higher wattage than other outdoor lighting applications such as billboards, roadways, and parking lots. While HID lamps are very efficient, they require significant time to warm up and achieve full brightness after being extinguished. This characteristic contributed to the length of the delay in last Sunday's Super Bowl game after a power disruption knocked out some of the stadium lighting in the Superdome. According to a 2012 U.S. Department of Energy (DOE) study, 17% of all U.S. lighting energy consumption is used outdoors, and 83% of outdoor lighting consumption comes from HID lamps. Unlike other lighting types, which can be found in a wide range of applications, HID lamps are generally limited to outdoor, warehouse, and industrial use because of their high levels of light output. For instance, a 60-watt incandescent lamp (or an equivalent compact fluorescent using only about 14 watts) will produce about 800 lumens of light output per lamp. Most residential and commercial applications only need each lamp to provide light levels in the range of about 800 to 4,000 lumens per lamp, but HID lamps can provide more than 15,000 lumens per lamp, making them suitable for places like sports stadiums, factories, and warehouses, where large areas need lots of light. Other lighting types, such as light-emitting diode (LED), incandescent, and halogen lamps, are used in applications like signals, signage, and other general illumination. High levels of light output require a lot of energy. But HID lights are about as efficient, if not more efficient, than other lighting types on a lumens-per-watt basis. As seen below, HID lights provide 75 lumens of light per watt—making them more efficient than some other lighting types that are also used in outdoor applications. One disadvantage of high intensity discharge lights is their long warm-up and restrike times. As millions of viewers witnessed, last Sunday's Super Bowl had a 34-minute outage. The New Orleans Superdome uses metal halide lights, a type of HID lamp, as its main overhead lighting in the arena. After the power outage during the Super Bowl, it took several minutes for power to be restored and then more time for the lights to restrike, or achieve full brightness after being extinguished. Because of the way the lamps work, restrike times are often longer than initial warm-up times and can take 5-20 minutes to achieve 90% brightness. According to the Lighting Research Center at Rensselaer Polytechnic Institute, some types of metal halide HID lamps use a different starting mechanism that can cut warm-up times down to 1-4 minutes and restrike times to 2-8 minutes.